The word Yoho is the Cree word expressing awe. This 1313 sq. km (507 sq. miles) national park is filled with gem coloured glacial lakes and waterfalls, snow-covered peaks and dense forests of western red cedar and western hemlock. Historic railroads, spiral tunnels within mountain sides and steep rock faces where mountain goats roam are just some of the sights to be seen. Other Yoho marvels include a natural rock bridge over the Kicking Horse River, Hoodoos, some of Canada's highest waterfalls and the Burgess Shale fossil find where over 120 marine animal species dating back as far as 530 million years were discovered. The park is located on the western range of the Rocky Mountains near Golden, BC, and borders on the Banff and Kootenay National Parks. Access is via the Trans Canada Highway. 1. Kicking Horse Campground is located 4.2 km (2.6 miles) east of Field via the Yoho Valley Road. There are 86 sites with kitchen shelters, fire pits, firewood, toilets, showers, a playground and outdoor theatre. 2. Monarch Campground is located 3.2 km (2 miles) east of Field near the beginning of the Yoho Valley Road. There are 36 sites with a kitchen shelter, pump water and toilets. This campground is open for winter camping. 3. 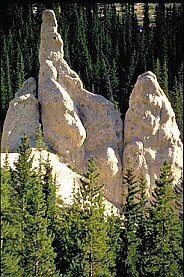 Hoodoo Creek Campground is located 23.8 km (14.8 miles) west of Field. There are 106 sites provided with 4 kitchen shelters, firewood, firepits, toilets, a palyground and outdoor theatre. 4. Chancellor Peak Campground is located 23.8 km (14.8 miles) northwest of Field. There are 58 sites with kitchen shelters, pit toilets and pump water. 5. Takakkaw Falls Campground is located 13 km (8 miles) north on the Yoho Valley Road. There are 58 sites with toilets, pump water and 2 kitchen shelters provided. 6. 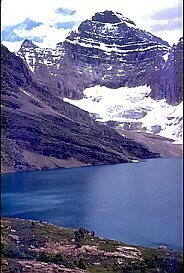 Lake O'Hara is a 13 km (8 mile) hike on the Cataract Brook Trail. There are 30 tent sites available with toilets, firewood, bear-proof storage areas and 2 kitchen shelters provided. An extensive trail system leads the visitor to the park's scenic attractions and notable features. Guided hikes are available to the Burgess Shale World Heritage Site.